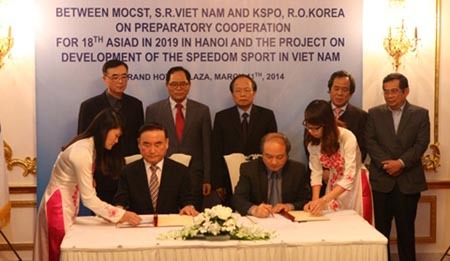 HANOI (VNS) — Viet Nam and South Korea agreed to co-operate in sporting activities at a Memorandum of Understanding signing ceremony between the two sides on Tuesday. South Korea will assist Viet Nam organise the 18th Asian Games in Ha Noi in 2019. And Viet Nam will introduce South Korea's track cycling events to the country.